Guests of Lake Pointe Inn are always asking us for suggestions on what to do at Deep Creek Lake. Boating, canoeing, kayaking, biking, hiking, shopping and fishing are all available within walking distance of our inn, but sometimes guests just want to get in the car and drive. For those guests, we suggest taking a day trip out of state. Our location in western Maryland is ideal for crossing the border into Pennsylvania or West Virginia. One of our favorite places to visit out of state is Blackwater Falls State Park in West Virginia. Blackwater Falls State Park offers affordable fun for all ages year-round, and it’s less than an hour from Lake Pointe Inn. Here are four ways we like to have fun at Blackwater Falls State Park. Blackwater Falls is one of the most photographed sites in West Virginia and the namesake of Blackwater Falls State Park. 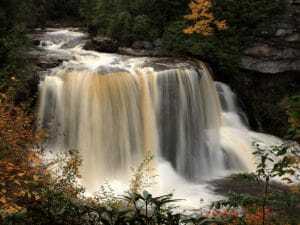 Traveling in the area, it’s difficult to miss all of the postcards, calendars, puzzles, and stationary featuring images of the falls, but we insist you see Blackwater Falls in-person! The unique amber-colored waters tumble down five stories into an eight-mile long gorge. It’s a short walk from the Blackwater Falls Visitor Center and parking lot to a viewing platform near the top of the falls. For the more adventurous, hiking trails continue down to the basin of the falls and throughout the entirety of Blackwater Falls State Park. Blackwater River in the Blackwater Falls State Park is stocked weekly with trout from early spring to early summer. Try to catch a brook trout, the only trout species native to West Virginia streams. The brook trout is the official state fish of West Virginia, but you can’t take it home with you. It’s catch and release only in the state park section of Blackwater River. Sledding at Blackwater Falls State Park is sledding at its best (and easiest)! Sledders ride a 1400-foot conveyer belt, believed to be the longest in North America, to the top of the sled hill and then cruise down the sled run. Sled rentals are available for half-day or full-day sessions. Grab some homemade soup at The Warming Hut to warm you up after a few trips down the hill. Another fun activity at Blackwater Falls State Park is cross-country skiing. More than ten miles of park trails invite the beginner or experienced cross-country skier to Blackwater Falls State Park. Many of the trails are groomed and maintained specifically for cross-country skiing. Take advantage of ski lessons and cross-country equipment rentals from the full service cross country ski center. The Blackwater Falls Cross Country Ski Center and Sled-Run is open from mid-December through March 15th. As you can see, Blackwater Falls State Park is the place to have fun year-round. In warmer months, enjoy hiking around Blackwater Falls or fishing for trout in the Blackwater River. In the winter months, rent a sled or take cross-country skiing lessons and explore Blackwater Falls State Park in the snow. After your day trip to West Virginia, return to the comforts of Lake Pointe Inn where we will have complimentary drinks and snacks waiting for you. Request a free copy of our vacation guide to start planning your vacation to the greater Deep Creek Lake area today. Photo courtesy of Frank Kovalcheck.